Oh, Straw Hat. Where to even begin? 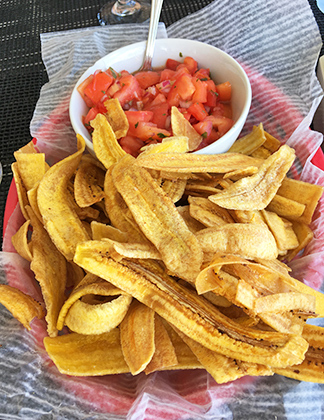 Straw Hat captured our hearts (and our taste buds) from one of our very first visits to Anguilla. 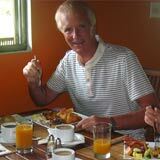 The consistent cuisine, the friendly yet professional service, and of course, the owners, Peter and Anne Parles. Every aspect kept us coming back trip after trip, meal after meal. Back then, Straw Hat was all blue-clad and wooden, so elegantly perched over the waters of Forest Bay. 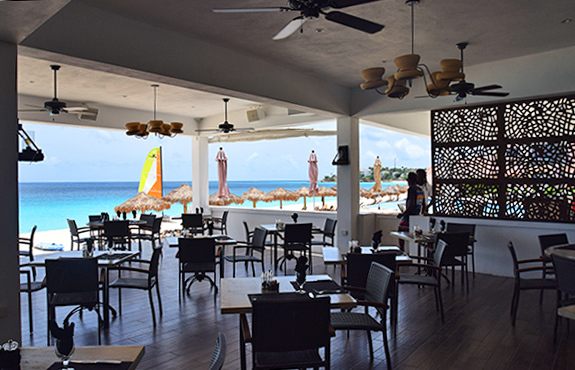 Open only for dinner, there was no such thing as "beaching and lunching" at Straw Hat. And breakfast? Nope! Not on the menu. 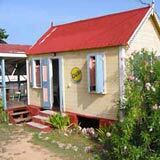 Still, it had cemented itself in our hearts as an "Anguilla best." 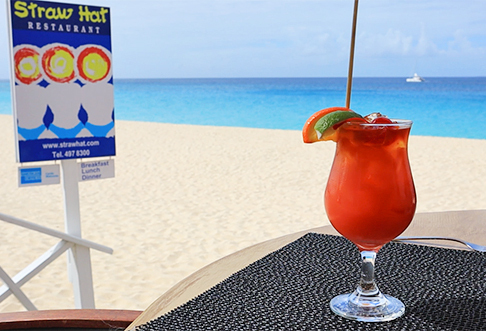 The spot to start and end our Anguilla vacations. Fast forward to today, and Straw Hat remains one of our all-time favorites. 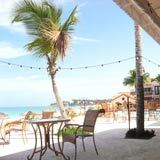 It now sits on the shores of magnificent Meads Bay inside Frangipani Beach Resort. And you can get your Straw Hat fix for every meal, every day. It's not hard to see why we always look forward to meals at Straw Hat. 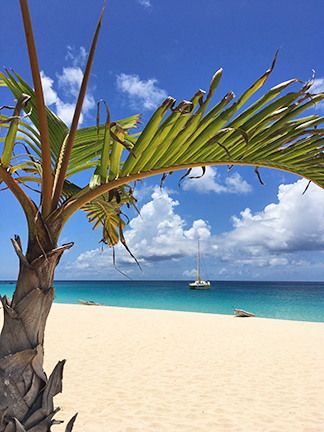 When you see Straw Hat's swaying palms and Meads Bay blue you immediately breathe a sigh of relief. A consistently excellent and most relaxing dining experience awaits. Straw Hat's oversized and shaded terrace is built for long, leisurely lunches. If you prefer, though, you can dine outside on their beach chaises (lunch is served to your beach chair). We always opt for lunch inside. TIP: Show up early to grab a front row table. 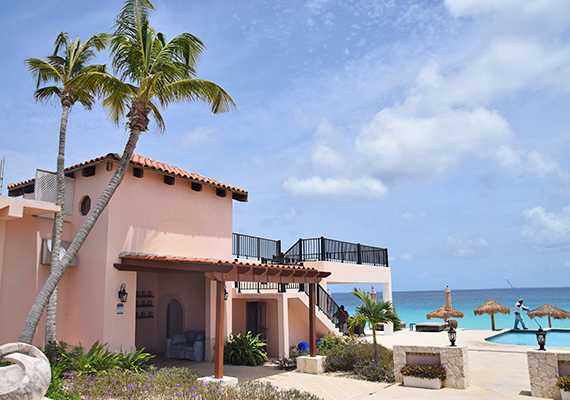 They have the best views of Meads Bay blues. When You See The Sign, You Know What To Do! 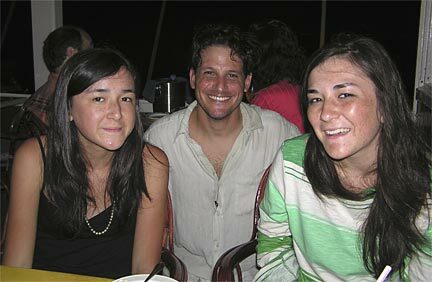 Jarelle, Armel and Shayne are friendly faces at Straw Hat. They deliver a consistently, comfortably excellent experience, always ensuring there's water in your water glass and Prosecco in your champagne glass. Yes, they make the Straw Hat team. And that is precisely where long leisurely lunches at Straw Hat begin. With a chilled glass of Prosecco and a rum punch, what's next? The crispy, warm chips go perfectly with the cool tomato salsa. It gives each bite a refreshing kick. 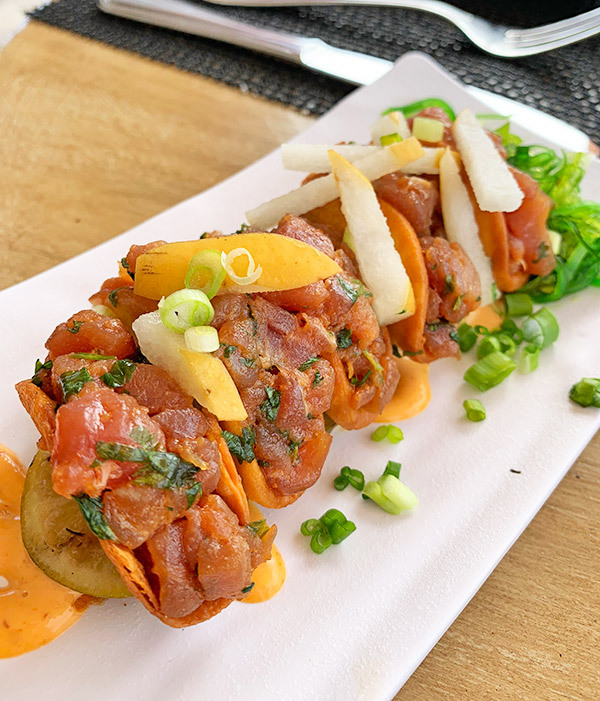 Sashimi tuna bites with wakame, blackened limes, crunchy Asian pears, cilantro, sesame seeds & a spicy aioli, all encased in mini-taco shells. Fresh and light, it is a perfect dish for the table. 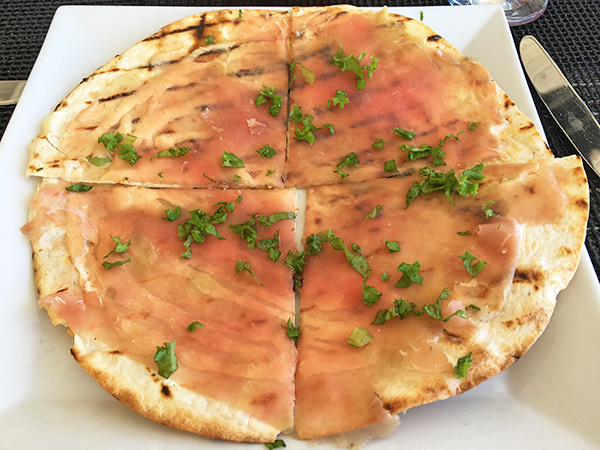 Fine slices of fresh tuna are gently placed atop thin flatbread. The flatbread is lightly dusted with wasabi, and lathered with a generous portion of ponzo aioli and black truffle oil. The final touch is the sprinkling of garden herbs. A creation so rich in savory flavor, I am always tempted to order two. Chunks of roasted chicken breast are mixed with lettuce, tomato and mayonnaise, wrapped in a flour tortilla and grilled. It is served with a side of coleslaw, a dill pickle spear and Straw Hat's signature fries, some of the best fries we have ever tried. Thin and shoe-string in style, they are light, airy and all around addictive. 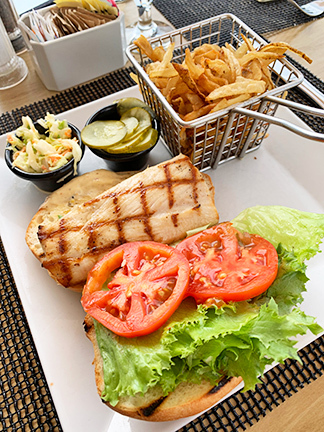 Grilled fillet of Mahi Mahi fish with spicy jerk aioli (mildy spicy) is served on a soft Portuguese roll. With coleslaw, kosher pickles and Straw Hat fries, it hits the spot! That's the only part that's hard to stomach. 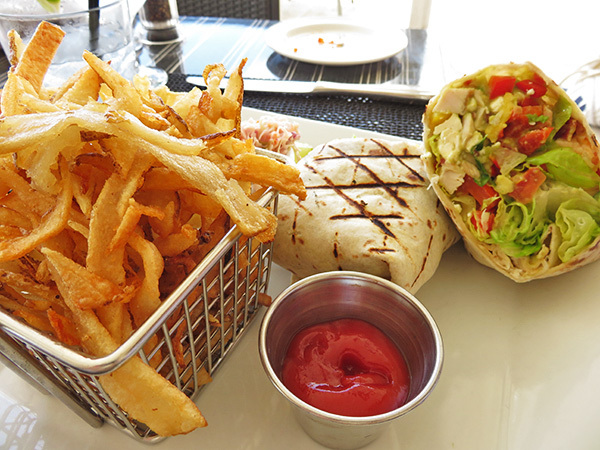 Lunch at Straw Hat is always perfect in every way. Gazing off into Meads Bay blue, "Can we get a redo?" is the thought that's always at the tip of our tongues. To make the whole experience last a little longer, it's a second glass of Prosecco. ... maybe a dessert, too. 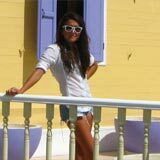 ... maybe a dip into Meads Bay blue. 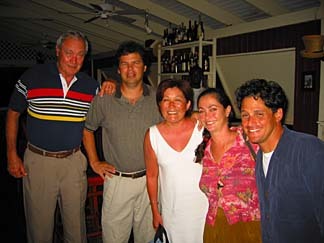 ... and maybe even a quick return a few hours later for one of the most memorable ways to spend an evening in Anguilla. 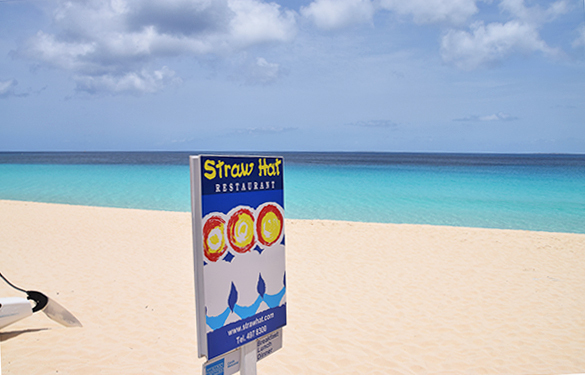 Before moving to Anguilla, Straw Hat was forever our favorite way to end each and every Caribbean island vacation. 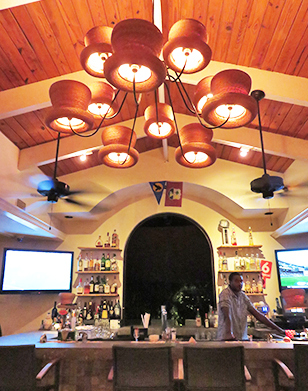 Since moving to Anguilla, Straw Hat has become a spot for celebrations. Some of our family's most memorable evenings have been spent inside this very restaurant. It was 2008. The lease on our apartment in Montreal had run out, our things had been packed onto a container, and we were ready to start living on island time. That's right, our tropical home would be getting a little more use than two weeks at Christmas and one for Spring Break! 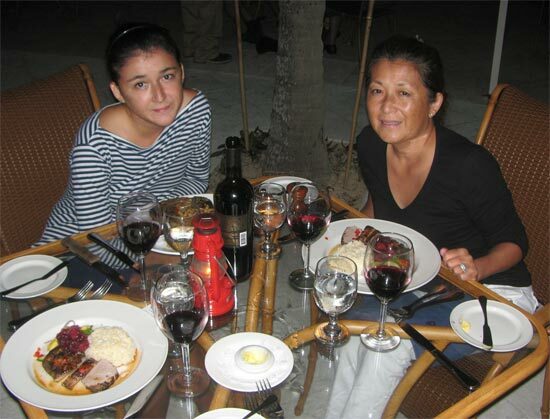 My Mom, Dad, and Yuki had arrived in Anguilla four months before me. They left me in the land of ice to enjoy a few months of rain, sleet, and snow (on top of mountains of homework!). 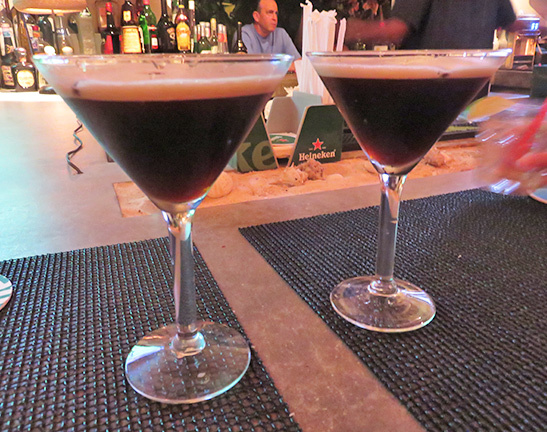 When I finally had made it to Anguilla, the big question was "Where to celebrate?" Without hesitation I exclaimed, "Straw Hat!" The staff was as friendly as ever, making us feel right at home. It didn't take long for my sister to spot her favorite, the steak. I checked to see if mashed potatoes were still somewhere on the menu, and my mom located anything "jerk." My Mom started with the soup of the day, Yuki had a mixed salad, and my Dad and I split the spring rolls. They have always been a must-try. For mains, I went with the snapper. 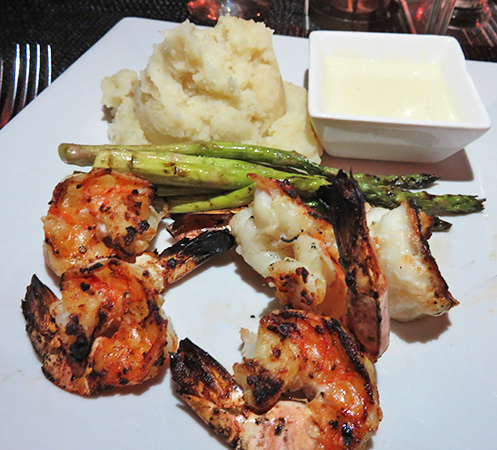 On a holiday in Anguilla, it's hard to beat a perfectly grilled snapper. ... and no one tops Straw Hat! But, my favorite part? The mashed potatoes. They are always heaven. My Mom went with the jerk tenderloin. My Dad followed her lead. 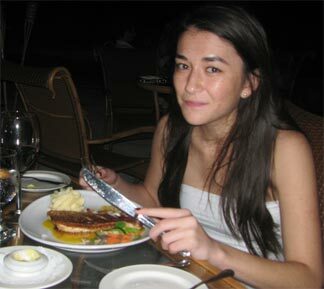 Meanwhile, Yuki could not be swayed from her steak and fries. Then, it was back to dinner. And once our plates were cleaned? No complaints. Well, I remember my Dad claiming his mouth was on fire, but that was a good thing! It's tradition to leave Straw Hat bursting at the seams, and this time at Frangipani Beach Resort was no exception. We didn't even have room for dessert. 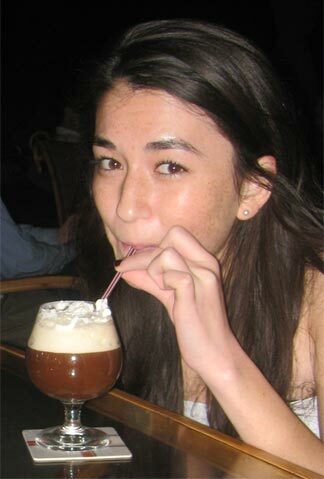 Instead, the evening came to a close over an Irish coffee and a chat about the life changes ahead. It had been a picture-perfect evening, the kind of evening that makes you feel "home." There was no place more fitting for our first evening in our new home together. 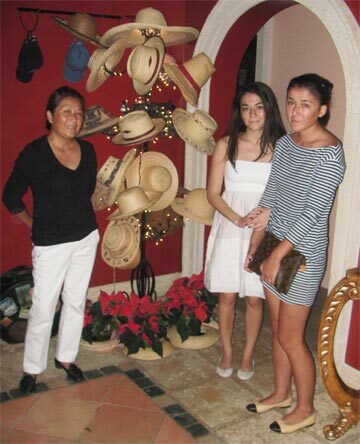 Maybe we are sentimental, or maybe it is "true Straw Hat love." Whatever the case, Straw Hat remains a favorite today. Otherwise, it is exactly the same. That is, our love for Straw Hat remains. 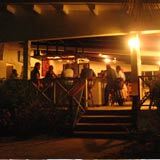 Directions: Located inside the Frangipani hotel on Meads Bay. 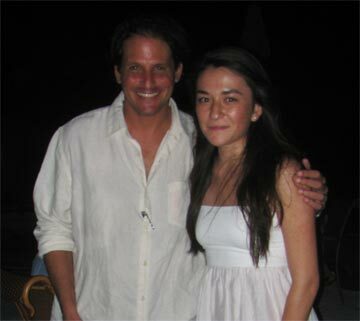 Good for relaxed yet five-star, beach-side dining. Hours: Breakfast, lunch, dinner 7 days/week.